At OB-GYN Women’s Centre of Lakewood Ranch, we are always trying to simplify women’s healthcare. That’s why we offer both gynecological and obstetrical ultrasound services in our office. It’s just one of the ways we are dedicated to providing comprehensive healthcare to women. How Do I Prepare for My Ultrasound? Getting ready for your first pelvic ultrasound couldn’t be easier! Before you appointment, be sure you wear loose fitting, comfortable clothing. The ultrasound sonographer will need access to your abdomen, so be sure not to wear anything that could restrict access to that area. To get the best possible ultrasound image, be sure you have a full bladder. Before your ultrasound drink two or three glasses of liquid, preferably water. If you are having a sonohysterogram, then you should stop drinking fluids four hours before the exam. 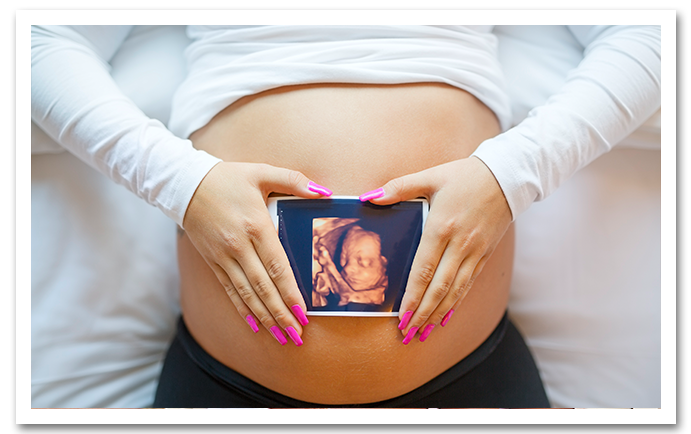 Ultrasounds are an important part of any pregnancy. Not only do they provide the unique opportunity to get a sneak peak of your little one, they give vital information on the development of your baby. Every expecting mother should have regular ultrasounds as a normal part of their prenatal care. Ultrasounds are not just for expecting mothers. They are used to look at a woman’s ovaries, uterus, cervix and fallopian tubes. This makes ultrasounds an essential tool when it comes to diagnosing many common pelvic conditions. Often, we will use ultrasounds as a diagnostic tool to find the source of pelvic pain or unusual vaginal bleeding. There is nothing more special than the first time a mother sees her child’s face. At OB-GYN Women’s Centre of Lakewood Ranch, we give you a complete view of your baby with our 3D and 4D ultrasounds at an affordable additional price! The two ultrasounds are very similar, however a 4D shows you the 3D ultrasound images in motion. What is so special about this kind of ultrasound is that you are able to see you child’s entire face and body. These kinds of ultrasounds are not a medical necessity, however they make a great keepsake you and your family will cherish for years to come. It’s a great way to bond with your child before they arrive. Patients can also schedule an appointment for a 3D & 4D ultrasound when they are ready to find out the gender of the baby, take home pictures of the baby and more! We also offer, My Baby’s Heartbeat Bear, which allows us to record the baby’s heartbeat into a small speaker that is then inserted into a stuffed animal of choice. It makes for a great keepsake and memorable gift for the whole family! Sometimes, a regular ultrasound just doesn’t tell us enough. If you have heavy bleeding, trouble getting pregnant or other pelvic issues, your doctor may suggest a sonohysterogram. This is a transvaginal procedure, which gives the doctor a better look at the reproductive organs than a regular ultrasound would. The procedure is also helpful for diagnostic purposes. This is an ultrasound evaluation that is combined with a maternal blood test to evaluate the fetus and identify risks for specific chromosomal abnormalities. This optional test is offered between the 11th and 13th week of pregnancy. At OB-GYN Women’s Centre of Lakewood Ranch, we know complete health care is important when you’re searching for an OB-GYN. That’s why in-office ultrasounds are just one of the ways we are dedicated to providing comprehensive and quality health care services to all women. Call for an appointment today and discover the difference of personalized health care.